For anyone that found the TV series Robot Wars totally inept at satisfying your childhood urges for giant robots beating the crap out of each other, help is at hand. 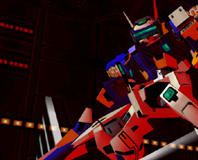 For 1200 Xbox Live Arcade points, you could battle your own mechs in the awesomely arcdady world of Virtua On. Sony have finally blinked, demonstrating the first playable PS3 game, Mobile Suit Gundam, recently in Japan. Screenshots and video are available for download.